Acclaimed Polish film director Krzysztof Krauze's 2004 masterpiece, My Nikifor, one of the most highly and widely honored works of Polish cinema, is being shown at the Museum of Modern Art in a special tribute to the Karlovy Vary International Film Festival - one of the world's oldest and most esteemed film festivals, founded in 1946 in the Czech Republic. 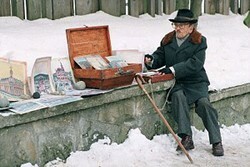 Epifaniusz Drowniak, a physically and mentally handicapped naïve painter, dismissed as a village idiot in his health-resort hometown of Krynica Gorska, eventually became known as Nikifor Krynicki (1895-1968), one of the most highly regarded primitive painters in the world. His small paintings - mostly water colors and gouaches - in which he combined realistic observations with his own emotions, were shown in 1932 in "Galerie Leon Marseille" in Paris and have been highly prized by collectors ever since. The film recounts the difficult friendship that developed between Nikifor and a young academic painter, yearning for artistic greatness, who discovered the old man's genius and gave up his own mediocre career to nurture that of the greater artist. Though highly praised in all its aspects (direction, acting, lighting, music), My Nikifor attracted exceptional notice above all because of the extraordinary performance by the late, venerable star of stage and screen, Krystyna Feldman, who at age 85 played the male lead as Nikifor. Following critical and popular acclaim in Poland, at the 2005 Karlovy Vary festival My Nikifor won the awards for Best Film, Best Director, and Best Actress. The film and its star Krystyna Feldman went on to win top awards at festivals around the world, including the Valladolid International Film Festival, Cinemanila International Film Festival in Manila, International Film Festival in Pune, India, the Panorama of European Cinema in Athens, the Chicago International Film Festival, where the film won the Golden Hugo, and Roman Gancarczyk, who plays the younger artist, won the Silver Hugo - and the Denver International Film Festival, where My Nikifor won the Krzysztof Kieslowski Award for Best European Film. Share this event on your social media.